Zendio is simple to use. 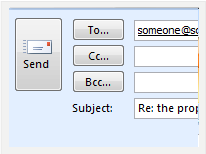 You don’t need to take any additional steps when you send your emails. An easy software download installs the email tracking software add in into your Microsoft Outlook and instantly enables you to track your emails, receive read and click-through notifications and provides access to additional data and features. 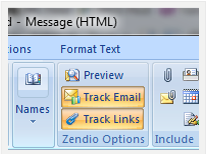 Once you install Zendio, a simple click will open the program and install it in Microsoft Outlook. 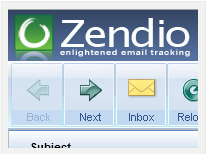 By default Zendio is now activated and automatically tracking when someone reads your email or clicks a link. Of course, you can disable the notifications at any time. 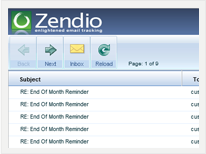 To start using Zendio send an email just as you do now. There is no software to learn and no additional steps needed. As soon as the recipient reads your email or clicks on a link, you will be notified via email or text message of the exact date, time and approximate location of the recipient. 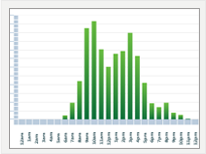 You can also check out the Zendio Tracking Inbox where all your past email delivery confirmations are archived and searchable so you always have the data you need at your fingertips. Click the Tracking button in Outlook to launch the Zendio Tracking Inbox. 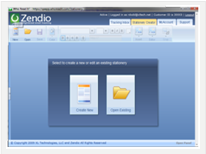 With Zendio Stationery creator you can promote your brand with every email that you send. Just pick a template that best matches your business. 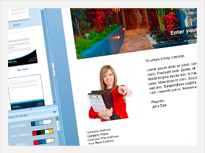 Then customize it with your picture, logo, personal and company information.